All content copyright Sensitive Skin Survival 2010 (c). Powered by Blogger. As I've mentioned on this blog before, my boyfriend has dreadlocks. Here he is. Isn't he gorgeous? It's not a great photo of me as my skin was pretty bad at that point. I had to go a whole metal festival without wearing any eyeliner because I had eczema on my face. Wah! But anyway, the photo shows Arron's dreads in all their glory. They never smell or anything - he's a very clean person, and I do love them (and him) rather a lot. When we first started seeing each other my skin was fine, and then pretty rapidly, my eczema went terrible! And I also got an eye infection. However, this also coincided with me moving into a new place, and it's just as likely that the change in environment was the trigger. My skin has settled down an awful lot since then - and now we live together, so the dreads can't have been the cause. To reduce any skin irritation from dreads, wash them every few months with bicarbonate of soda, taking care to really wash the dreads themselves as well as the scalp. It takes a bit of drying afterwards - but it's worth it. Hi! I have been an eczema sufferer for many years too. My skin was in terrible condition and I was using a lot of steroid creams. I didn't like using them as I was aware of some of the dangers, but every time I tried to stop using them my skin just got worse and worse. Eventually my GP told me to stop using hydrocortisone on my face because I had damaged my skin. It's scary reading, but it made sense of everything I was going through. Everything about my skin condition started to make sense. From experience I can say that topical steroids have made my skin far more sensitive and prone to flare up than it ever was before, and if you have ever used steroids for your eczema, the research by Dr. Rapaport is worth a read. Good luck with your quest to find gentle skin products, and thanks for your indormative and interesting blog. Oh interesting - my boyfriend has dreads too! I haven't had any problems, but I'm not prone to eczema. Hi, just started following you on Twitter and thought I'd have a snoop about your blog. 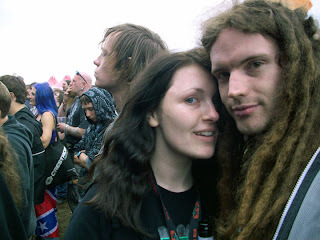 I spy your Bloodstock lanyard; another metal head who has eczema - yay! Haha. I find that because my eczema has deteriorated so much I can't camp any more. The heat and humidity of the tent, alongside not being able to carry out my strict routines means that I'm no longer able to experience the proper festival atmosphere. But as I've been going to Bloodstock since 2006, I can't just give that up! Last year, and indeed this year, I am hotel-ing it :) do you have any problems with festivals? & to answer your question: Could it be more that it's the texture of the dreads that were causing flares? Just checked out your blog too - oh your skin looks so sore! I really hope it gets better for you soon. My skin was giving me real trouble that year but it is quite a lot better now. Don't go to many festivals though tba, too picky haha. And yes I think you are right about the texture of the dreads, but there are a lot of skin particles trapped in them too. We cut them last year (just a 6 inch trim!) and you could see the dust in their core. We have got some dread shampoo for him now though, which is good stuff. Do your allergies change every 7 years because your body chemistry changes every 7 years? Copyright (c) 2013 Sensitive Skin Survival.